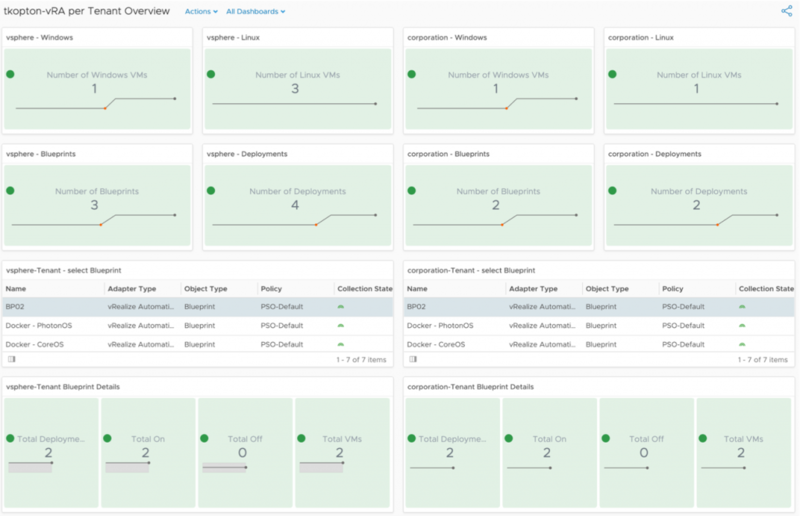 As many of you are probably aware, vROps provides an easy and comprehensive way to monitor and manage a vRealize Automation (vRA) environment through utilizing the Native Management Pack (NMP) for vRealize Automation. The MP gives you a variety of pre-configured dashboards, view, alerts etc. which all work perfectly fine and give you a sufficient view of the environment if your vRA is dealing with only one tenant. Of course are vROps and the Management Pack capable of collecting and displaying information for multiple tenants, the problem is, that some content aggregates numbers across all tenants. But what if you have multiple tenants and you would like to see e.g. environment numbers for each and every tenant separately? How many deployments have been done by tenant X and how many Linux VMs have been deployed by tenant Y? This sample Dashboard shows different numbers (deployed VMs with a certain OS) on a per-Tenant basis. As this is just a sample, you will need to adjust the names to reflect your naming convention.